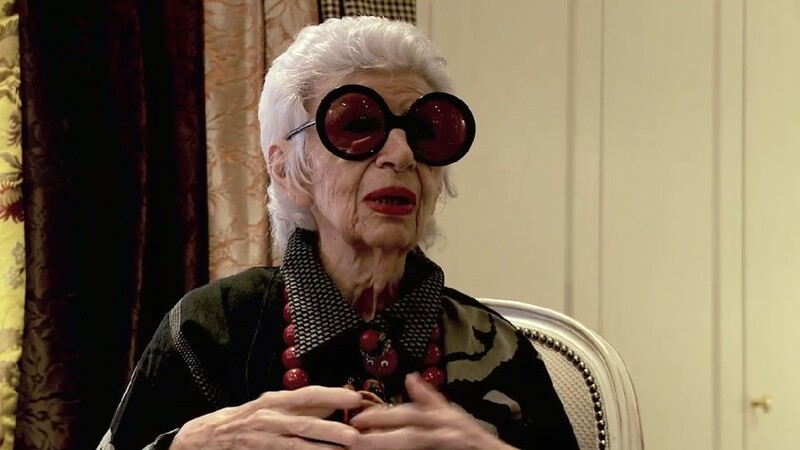 "I think style is all attitude; attitude, attitude, attitude," Iris Apfel shares at the beginning of Albert Maysles' work-in-progress documentary. "If you know how to carry something off, you can make it look wonderful." Apfel also reveals that everything good in her life has just happened – and it's the unscripted that is crucial to Maysles' success too, making his impact with brother David as a pioneer of the documentary genre, or direct cinema. Born in Boston of Jewish immigrants from Eastern Europe, Albert Maysles taught psychology for three years before making the transition to film in the summer of 1955, taking a 16mm camera to Russia to film patients at several mental hospitals. Several years later, the Maysles brothers made a motorcycle journey from Munich to Moscow and along the way shot their first collaborative film on the Polish student revolution, following with Primary, a film about the Democratic primary election campaigns of Kennedy and Humphrey in 1960. Maysles was made a Guggenheim fellow in 1965 and his next three films became cult classics: Salesman (1968); Gimme Shelter (1970), his portrait of Jagger and the Stones which culminated in a killing at their notorious Altamont gig; plus 1976's legendary Grey Gardens, which told the relationship of a mother and daughter living in a decaying East Hampton mansion. "As a documentarian I happily place my fate and faith in reality," Maysles says. "It is my caretaker, the provider of subjects, themes, experiences – all endowed with the power of truth and the romance of discovery. And the closer I adhere to reality the more honest and authentic my tales. After all, the knowledge of the real world is exactly what we need to better understand and therefore possibly to love one another. It’s my way of making the world a better place." In celebration of Dazed's latest cover, we spoke to Maysles about his work-in-progress documentary of Iris Apfel, screening a preview of the film. Dazed Digital: How did you encounter Iris and what do you admire about her? Albert Maysles: Jennifer Ash Rudick, a producer on the film and friend of Iris brought the project to us. I admire that Iris is such a strong, genuine person who is always working on so many different things – her style and sense of humor… that face! – have been a delight to film. DD: What's been the best moment so far of making this documentary? And when do you hope to release it? Albert Maysles: We hope to finish the film for Autumn 2013. The best moments so far have been when we've been able to get past the public persona of Iris and to who she really is: in her NYC apartment with her husband and love, Carl Apfel, looking through her vast clothing, jewellery and stuffed animal collections with her; shopping at street vendors’ stalls in Harlem with designer Duro Olowu and filming her with her friend Bruce Weber. DD: Your documentaries had a strong impact on filmmaking, creating a new genre and reshaping the art. Did you realise at the time what you were doing was so radical? Albert Maysles: It all came naturally, no need for a host narration or script. Delve into what is already there and the beauty of humanity reveals itself organically on screen. By getting close everything fell into place so naturally. Iris, at 91 mind you, has such an appeal and a bundle full of talents. No need to stage it. I came to realise that this is a blessing all around.